Your hip friend just made it through years of tedious studying. Now it's time to party like a rock star! 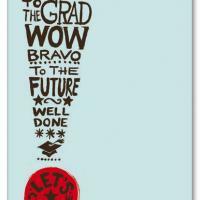 Invite friends and family to take part using these cool printable graduation invitations featuring words of congratulations in the shape of an exclamation point. These free printable invitations can also be used to congratulate the grad if you're not going to be around to party. Celebrate all of the accomplishments of the grad and party! After all, the next step is either more school or work, so take advantage of some free time while you have it.